Inverted aerosol house spray containing pyrethrins and permethrin to kill active flea and tick infestations. Also, contains pyriproxyfen (NYLAR® Insect Growth Regulator) to prevent flea infestations from developing for up to 7 months. One 16 oz can covers 2,100 square feet. Provides rapid relief from active flea and tick infestations. Contains the highest levels of environmental adulticides in an aerosol for maximum effectiveness and quick killing of fleas and ticks. Prevents flea and tick infestations for up to 7 months. Prevents reinfestation of fleas by stopping immature fleas from developing into the adult biting stage. Reaches fleas hidden in carpets, rugs, drapes, upholstery, pet bedding, and floor cracks for greater effectiveness. No mess. Leaves no unpleasant odor or sticky mess and, when used as directed, does not stain furnishings. 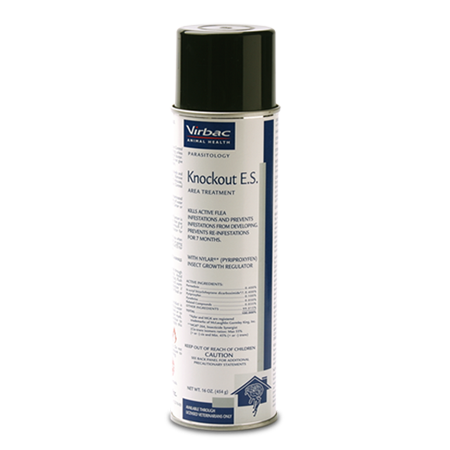 The KNOCKOUT Brand of products consist of two house sprays; KNOCKOUT Area Treatment and Knockout ES Area Treatment, and KNOCKOUT Area Fogger.